A letter from E. R. Trafford to Henry Shelton Sanford, dated March 15, 1884. In the letter, Trafford requested Sanford's signature for five deeds. He also indicated that from March 1, 1884 to March 15, 1884, sales for the town of Sanford amounted to $5,960 and sold for St. Gertrude's Grove reached $5,200 for a total of $11,160. 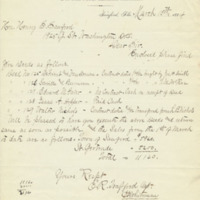 Original letter from E. R. Trafford to Henry Shelton Sanford, March 15, 1884: box 54, folder 18, subfolder 54.18.23, Henry Shelton Sanford Papers, General Henry S. Sanford Memorial Library, Sanford Museum, Sanford, Florida. 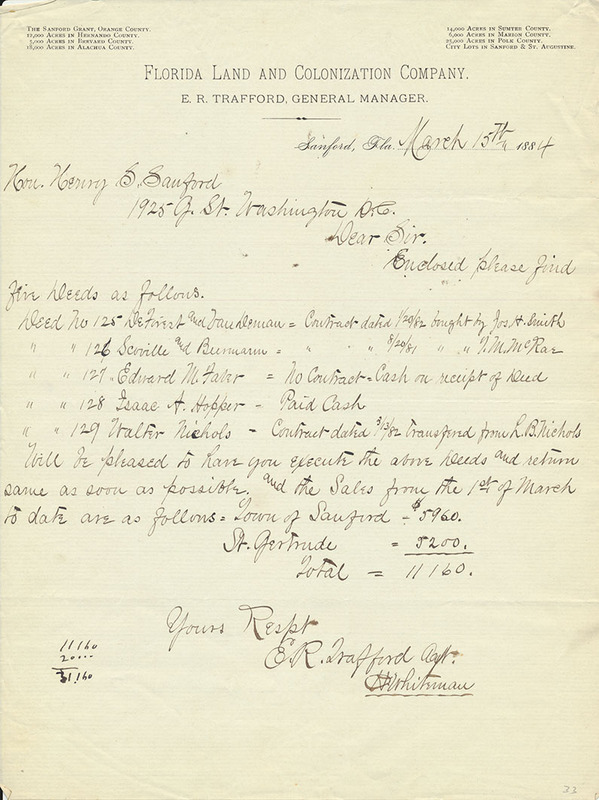 Digital reproduction of original letter from E. R. Trafford to Henry Shelton Sanford, March 15, 1884. Trafford, E. R.. “Letter from E. R. Trafford to Henry Shelton Sanford (March 15, 1884).” RICHES of Central Florida accessed April 21, 2019, https://richesmi.cah.ucf.edu/omeka/items/show/7690.